Some estate sale items are harder to sell than others. Selling vintage can be fickle. Location matters, depending on the region, city, or even neighborhood you’re in—because what’s hot in one area might be uncool in another. But times have also changed, and what used to be considered rare or valuable might not fetch the same price it once did. There are several reasons why a lot of stuff has lost its value, but one thing is clear: Millennials don’t want it. Times have changed, and younger people live differently than Baby Boomers and the Great Generation once did. First of all, technology has made everyone more mobile—people are changing jobs and locations more, instead of staying close to home. As a result, they don’t want to accumulate a bunch of things they’ll have to haul around. They’re more likely to spend money on experiences rather than trinkets they can display in a china cabinet. Younger generations also entertain differently than their parents and grandparents did. Often, they’d rather go out, and if they do entertain at home they’re not likely to serve a multi-course dinner on delicate china. When they do settle down, they’re starting smaller families, and have no need for enormous services with ten+ place settings. The fact that vintage dishes can’t be microwaved or put in the dishwasher also factors into convenience. (This goes for stemware, too). IKEA and other online design stores have also made brown furniture obsolete. We’re not talking about the midcentury Danish teak that’s all the rage. Rather, “brown furniture” is the stuff we see at almost every estate sale: well-crafted, solid wood furniture—as opposed to the the DIY plywood creations that get passed off as furniture today. Good luck getting market price, or even half price, on most run-of-the-mill estate sale furniture, unless you get ahold of designer or midcentury modern brands. While it might be frustrating to see the younger generation pass up these solid pieces in favor of furniture that won’t last, at the end of the day, something is better than nothing. Your job is to get rid of it, so plan to get well below what your client paid for it. Since your goal is to make the most money possible for your client, don’t plan for dumpster pick-up just yet! 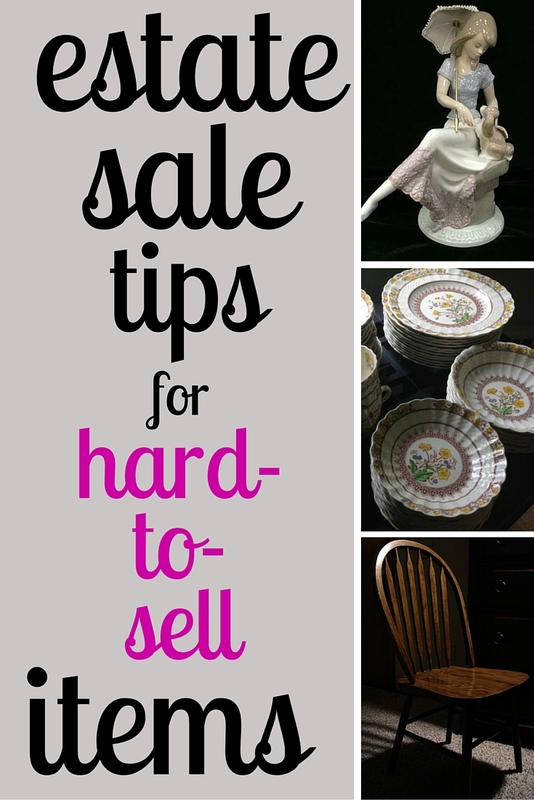 We heard from estate sale companies around the country to find out how they handle hard-to-sell items at their sales. You’re the professional, so you understand what the differences between retail, appraisal, and replacement costs are—but your client may not. Now’s the time for you to educate your client about the likely value of what they’re holding, so you can avoid any surprises in the end. If your client expects the worst, any profit will be appreciated. That is one way to run your business—and it might be better than shooting high and your client ending up disappointed. Explain what market value really means, how the economy affects prices, and of course, those darn millennials. That way when your client ends up with a nice chunk of change anyway, they’ll be pleasantly surprised. The little things, known in the business as “smalls,” can start to add up and can in fact offset the value of the bigger items you weren’t able to sell. What can make up for all that brown furniture? Anything related to celebrities, militaria, jadeite, antique toys and games, vintage Pyrex, and even certain ephemera. One way to prove this is true is to document, document, document. Keeping good records means you can use it as proof when you sell yourself to your next client. Sometimes people just need external proof to be able to face the reality of the situation. Just like a real estate agent might show you comparable houses in a neighborhood to illustrate value, you can always show your client comparisons, or “comps” of items and how they sold, including auction results, eBay, and numerous other sites on the internet to provide multiple examples of what items sell for currently. 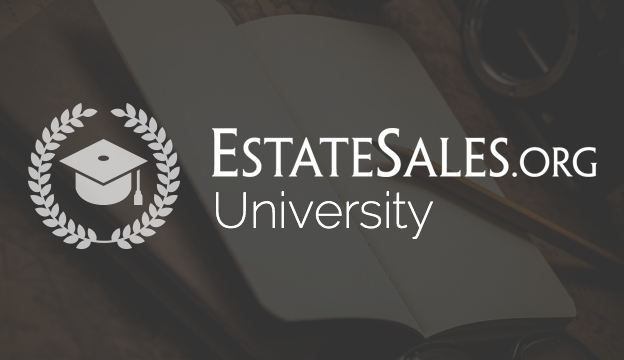 The Estate Sale Pricing Guide is a great online resource for comps. As an estate sale company, you know your clients often aren’t at their best. It’s a bum deal to have to hold an estate sale in the first place—since it’s usually for one of the 4 Ds: downsizing, debt, divorce or death. Not getting top dollar for a lifetime of stuff only adds to the heartache. Be there for your client. Julie Hall, executive director of ASEL has said she’ll sit there and cry with her client, because she understands what it means to be human. Sometimes all you can do is lend support and show your client you understand how they feel. A little empathy goes a long way. Of course, in the end, if items don’t sell, you can always donate them (especially the brown furniture) to places like your local church or nonprofit thrift shop—or even the bigger guys like Goodwill or Habitat for Humanity. You’ll be giving it to someone who really needs it, and your client will enjoy a nice tax write-off. Turn those teacups into candles, transform that brown furniture into something bright, modern, and new with some sanding and a fresh coat of paint. The options are endless and you can find many DIY ideas on Pinterest that will inspire you or your client to get creative. Don’t have time to do it yourself? Bring photos and inspire shoppers about the items’ potential if they’re willing to put in a little TLC. Many estate salers are. Just remember, you didn’t get into the estate sale business because you like to do things like everyone else. So if you’re serious about selling that outdated dresser, roll your sleeves up and channel your inner HGTV host. For hard-to-get-rid-of furniture, consider offering delivery service. Often times, someone won’t buy a bigger item because they have no way to get it home. If you can’t offer delivery, allow for delayed pickup times, so buyers can find a way to haul items. If you have a truck available, you can charge extra for labor and gas. No one likes to cut prices, but in the case of hard-to-sell estate sale items, sometimes offering discounts is inevitable. If it’s the second or third day and things still aren’t moving, lowering prices to 35-50% off can really help spur shoppers to take action. Somewhere between garage sale prices and retail prices is the sweet spot you want to hit. Consider the neighborhood you’re in and how popular the style is, rather than its actual value. Pricing takes time to thoroughly research each piece, so be sure to do your due diligence. We mean take really good estate sale photos. If you can hire a professional photographer, even better. Photos bring people to your sales, and furniture can look especially snazzy if staged well. When it comes to furniture, best luck is had when surfaces are clean. Don’t use hutches to display other items for sale, in other words. Show off the furniture, instead of hiding it! When it comes down to it, your client enjoyed the time he or she had with her stuff, whether it was time spent researching items, the trips taken to acquire their things, or just being surrounded by things that they love. In the end, this is what really matters and reminding your client of all the sentimental value they’ve enjoyed, rather than the financial loss, may be the best way for them to move forward, regardless of what happens at the estate sale. Which items have you had a hard time selling at estate sales—and how did you finally get rid of them?